Enjoy Utah! 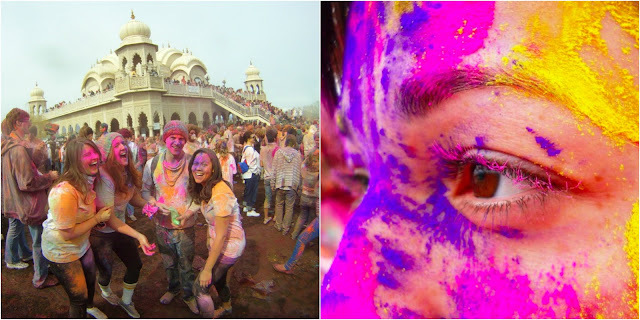 : Festival of Colors is Coming! Festival of Colors is Coming! For quick information, parking directions, etc. click here. 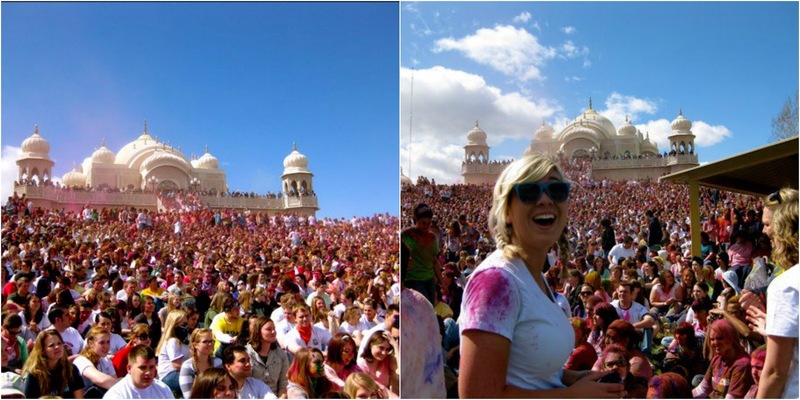 In India, Holi announces the arrival of spring and the passing of winter, and that's part of what the celebration is all about. To get a little more insight about the symbolism of the festival, click here. Guests are invited to throw their worries to the wind and join in celebration of the event. Every nook and corner presents a typically colorful sight. 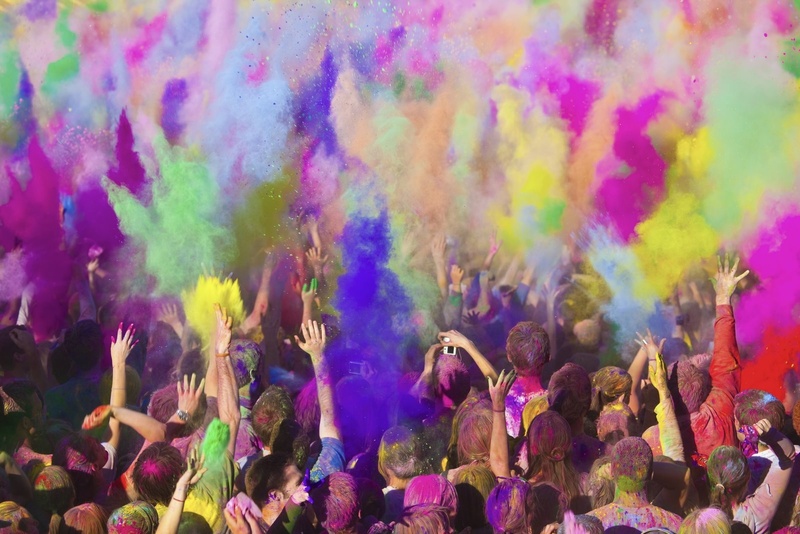 Young and old alike are covered with colors (red, green, yellow, blue, black and silver). People in small groups are seen singing, dancing and throwing colors on each other. Sounds like a handful of fun, right? Now for the nitty-gritty details that might help ease your anxiety about ruining your clothes. The "chalk" provided by the temple is actually colored corn-starch, so it won't stain. However, it is still not ideal to wear your "Saturday Best." If the chalk party isn't enough to pull you in, there is plenty more going on during the celebration. There will be musical interludes, yoga, mantra, dance, cuisine, the lighting of a bonfire, and burning of an effigy in between color throws. And plan accordingly! 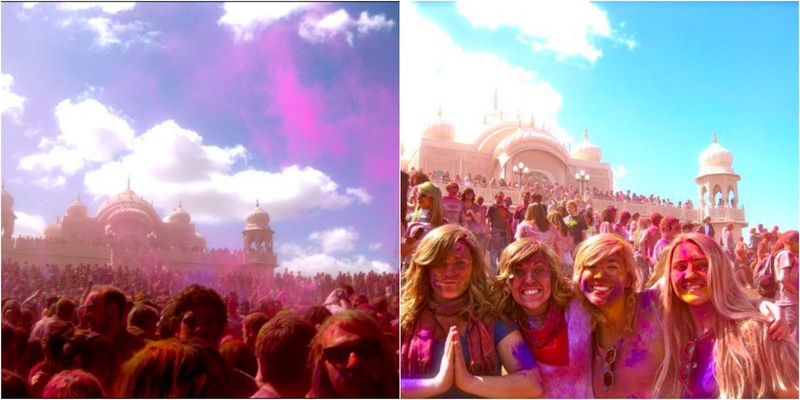 Colors will be thrown every two hours. This year, you also need to be aware that there is a modest entry fee of $3 per person, and in addition, you may want to buy chalk bags for $2. Parking also gets packed, as you can imagine. However, there are shuttle buses that will run from the Spanish Fork Fair Grounds, SF Sport Complex, and Salem Hills High School that you can ride for $2. Register in advance and purchase your chalk online! Be ready for a lot of fun & an experience of a lifetime! To get directions to parking and find more information on the Festival of Colors, visit http://www.utahvalley.com/events/details.aspx?id=1247. To buy your tickets and color bags (and bulk color bags for a discount) visit https://events.r20.constantcontact.com/register/eventReg?oeidk=a07e6fsuwrd45dd35ee&oseq=&c=&ch=. We hope you all get out to experience the Festival of Colors! It is definitely an experience that you have to see for yourself.